McDonald's, it's good for lazy Sunday evenings, not for the day of Luuuurve! So I can't just say: Il est mon cousin? Pourquoi? Aren't you describing a particular boy (il est) as being my cousin? C'est can be translated as either this is or it is. My guess is that it's context dependent. Me again. Never answered my question . In the video:" Les fleurs, c'est beau." C'est is singular, beau singular, fleurs plural. Why c'est and not Ce sont? La musique classique, c'est beau. 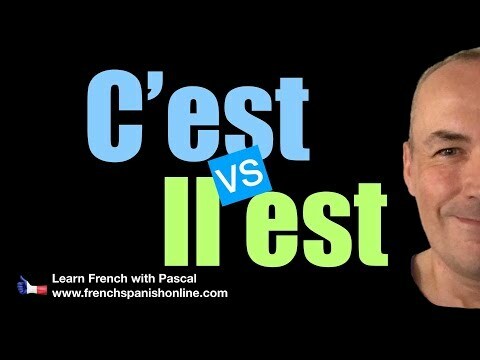 I did not see in the lesson or video where c'est could mean "this is". That sounds specific to me. What do you think? Hi Ashley - remember that 'ce' usually translates to 'this' or 'that' (and "c'est" is ce + est) but it's not usually very helpful to think about what individual words translate to in English. Expressions like "C'est amusement" can loosely be translated as "It's funny" or "That's funny". The actual sense will depend on the context. In a similar vein to my question below ( I don't know where to find the relevant grammar topic ), there are many places in french where it seems one must insert a definite article where it would be omitted in English-- here are a couple of examples: "Il y a même des alcools spéciaux en France qui sont synonymes de l'apéritif comme le Pineau, le Muscadet que l’on sert avec une liqueur de fruit. " "Vous serrez la main que l'on vous tend." Why can't you say "qu'on sert"," qu'on vous tend" ? Why is it not "Regarde ce dessin, il est superbe"
Bonjour Anish and Ron! Actually here I agree with Anish : "il est superbe" would indeed be better here, as this is a specific drawing you have already mentioned. I've now changed this example to better fit this lesson :) Merci beaucoup et à bientôt !